Sampleur virtuel qui grâce à sa structure modulaire permet de ne pas surcharger les ressources du processeur, et grâce à son moteur de resynthèse granulaire, peut traiter séparément la hauteur et la durée d'un échantillon. Il propose une grande quantité de traitements audio, filtres, effets, modulations, tous visualisables en un clic de souris dans un fenêtre dédiée. Grâce à son allocation dynamique des ressources, Kontakt gère de façon optimale les ressources du Mac pour des performances optimales. Il est compatible avec les formats AKAI S-1000/S-3000, Gigasampler, SF2, HAlion, EXS, SDII, BATTERY, REAKTOR Map, LM4, AIFF und WAV von 8 bis 32 bits, EMU (EIII, ESI, and EIV). Il propose 256 voix de polyphonie et 32 sorties audio par plug-in et est livrée avec 5 CD-rom de samples. Extended KSP format plus additional parameters for the KONTAKT engine, for optimised engine use with new instruments. Fixed a crash with the "Roland Quad Capture" audio interface. Improved updating parameter values in KOMPLETE KONTROL and MASCHINE. Fixed a crash when saving, while automation was assigned to theLFO phase parameter. In some scenarios Sample Modelling’s "The Trumpet” was detuned by a a few cents on Mac OS. Activation issue on specific high-end machines resolved. Fixed batch-resave issue which removed mappings from instruments in rare cases. Issue with only two folders being displayed if snapshots were in subfolders fixed. Key switches now always displayed on the virtual keyboard after project recall. Background loading display on the snapshot tab fixed. Quickly opening and closing the GUI with various DAWs no longer crashes. Rise and Hit and Logic Pro crashing issue fixed. Please note RTAS is no longer supported with this update. An important addition in KONTAKT 5 is the new Time Machine Pro algorithm, providing super-high-quality time-stretching — particularly suited to melodic and tonal material. Use Time Machine Pro for complete audio fidelity and imperceptible tempo-changes with all harmonic content intact. KONTAKT 5 provides a new feature in the Kontakt Script Processor: the MIDI file player. Useful for creating instruments that can play patterns, loops and grooves as opposed to single notes. As used in STUDIO DRUMMER's groove library, which provides over 3,500 exclusive beats and fills as production-ready MIDI patterns. Customers who buy KONTAKT 5, or update / cross-grade to KONTAKT 5, are eligible for a free copy of RETRO MACHINES MK 2. You'll receive this collection of 16 definitive analog synthesizers and keyboards once you have registered KONTAKT 5 - we'll send you a download link for your free copy. * Le fichier zip de cette update contient l'installeur d'une update pour la banque d'usine. * Mac OS X: support du 64bit pour le format AudioUnit et la versio, stand-alone . * Nouveau menu d'aide pour toutes les versions en mode plug-in . * divers problème indefinis de plantage par update de la gestion de la Convolution . The new Authentic Expression Technology sees KONTAKT 4 radically redefining the authentic reproduction of acoustic instruments with all their dynamics and articulations, while adding completely new options for creative sound design. In addition to the traditional way of sampling different volume levels of an instrument statically, AET is able to capture specific spectral characteristics of samples and gradually apply them to another samples in real-time, allowing you to seamlessly "morph" between different instruments' characteristics. This breakthrough allows for a new level in expression and realism when playing a sampled instrument. AET is especially powerful applied to solo instruments with sustained sounds - such as strings, brass, woodwinds, and choir: You can hold down a key and then seamlessly fade with the Mod Wheel between different articulations (e.g. trumpet playing with and without mute) or volume/dynamic levels with different harmonics. It's often possible to merge the acoustic characteristics of different instrument such as the piano and celesta in real time, opening new horizons for creative sampling and new kinds of hybrid instruments. In addition to the six collections available in the previous version, KONTAKT 4 now includes a comprehensive Choir Collection, recorded exclusively for Native Instruments, providing a complete set of soprano, alto, tenor and bass voices in different setups. Several instruments of the Choir Collection makes use of the new Authentic Expression Technology giving you a new level of control: the choir voices can seamlessly morph the vowels ("A-E-I-O-U") while holding a key/note, which is nearly impossible with other samplers. In addition, the Orchestral Collection has been updated with a new Solo Strings section, taken form the legendary Vienna Symphonic Library, and a concert hall organ, while the Vintage collection gets the famed Mellotron keyboard. Plus, all the e-pianos from ELEKTRIK PIANO are included. All in all, an extra 10 Gigabytes of new material enrich the KONTAKT library. KONTAKT 4 comes with more than 300 new and professionally recorded impulse responses from a wide rang of rooms, concert halls, churches, speakers etc, to add super-realistic reverbs to your instruments or the sonic characteristics of high-quality hardware equipment (amps, speakers, hardware reverbs etc.). The new impluse response samples are provided by Echochamber, Studiodevices and Acousticas. PERFORMANCE VIEWS provide custom control panels, that make Instrument-specific settings available without having to switch to Edit mode. In KONTAKT 4, a much larger control panel is available so each instrument has more important parameters accessible, as well as giving each instrument a distinctive feel through the easy-on-the-eye graphics. The enhanced KONTAKT Script Processor gives many more options for designing custom Performance Views and for controlling other KONTAKT areas such as the master section (when writing 'multi scripts'). It's never been easier to find the right sound or instrument. With the attribute-based browser you can search via keywords or browse by instrument type (bass, piano, strings). The complete KONTAKT 4 library has been pre-tagged for your convenience. You can also create custom attributes to tag your instruments according to your own criteria. Attribute-based browsing works for Instruments, Multis, Banks, Groups, Presets, and Samples. New Lossless Sample Compression format 'NCW' with real-time encoding – reducing the size of samples by up to 50%. Instruments with high disk streaming load, such as Grand Pianos, benefit from the fact that less data has to be read from hard disk. Note that the complete KONTAKT library is delivered in uncompressed WAV format - the Lossless Sample Compression is just an option for your choice when you save instruments. KONTAKT 3.5 features full support for 64-bit memory addressing in both Windows and Mac OS X. This means you can load more than 4 GB samples into RAM in both stand-alone and plug-in mode. 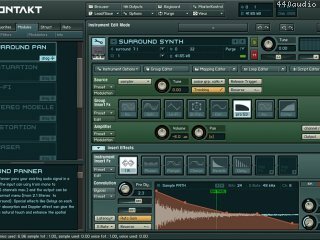 In Windows, 64-bit operating systems and sequencers with special stand-alone and VST versions are now supported. On Mac, the newly-created Memory Server feature bypasses the OS X's 4 GB limit and can address as much RAM as you have installed - even in 32-bit hosts such as Logic or ProTools. KONTAKT 3.5 features a completely re-designed sample playback engine. The Direct From Disk mode has been reworked to act dynamically, allowing the operating system to allocate memory in real time as you play and release voices. The result is a significantly smaller memory footprint which leaves more RAM for loading samples. This is especially useful with 32-bit systems where you can now load significantly more samples than was previously possible. KONTAKT 3.5 now provides true multi-processor / multi-core support. You can now switch multi-processor support on and off and set the number of processors / cores you want to use for KONTAKT. Up to 16 cores are now supported. KONTAKT 3.5 now features MIDI Learn function for all sliders and knobs including Performance Views. Assigning MIDI controllers to KONTAKT sliders and knobs is quick and convenient with multiple assignments also possible. KONTAKT 3.5 integrates a visually enhanced library tab that now makes browsing and loading samples and libraries quicker and easier. 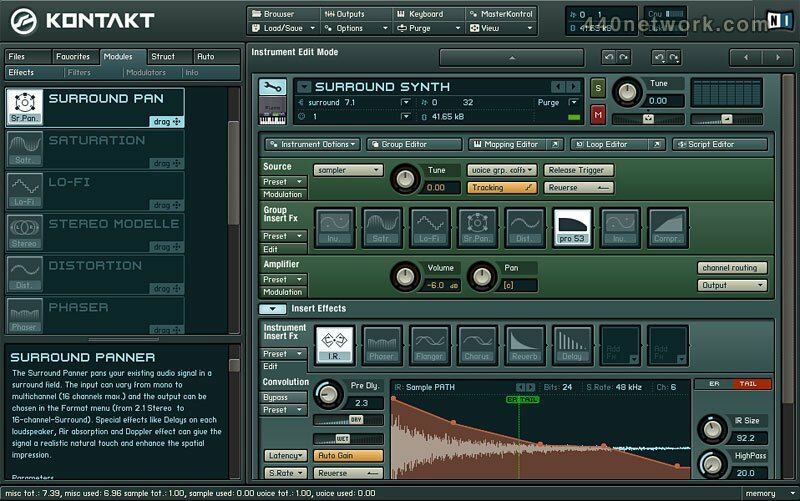 Further improvements in KONTAKT 3.5 include a bypass button for effect slots, localized info pane in six languages, improved automapping, Pro Tools compatibility under Mac OS X 10.5 Leopard, aftertouch interpretation added to KSP, a Play cursor for Beat Machine mode in Wave Editor and enhanced REX file support. IMPORT: Countless import bug fixes with emphasis on EXS, Gigastudio, Reason, Akai, and Emu. Changement de format : les sauvegardes ne sont plus compatibles avec les versions précédentes. Output configuration can now be changed and saved in hosts. Output config dialog now allows easy switching between channels. Hanging notes problem has been fixed. Library issues with incorrect glide default value have been fixed. Library issues with loading in non-DFD modes have been fixed. Issues with high CPU load have been fixed. Issues with start-up crashes have been fixed. CTRL+click in mapping editor now steps through zones. Program change for banks now works with all MIDI channels. Right-click on knobs now allows assignment of modulation. Modulation target names are now correctly updated. Engine restart now flushes effect buffers correctly. Several small inconsistencies have been fixed. Several import issues have been fixed. Several library patches have been fixed. New Beat Machine tutorial in the Documentation folder. Fonction Beat Machine permettant de découper des boucles en fonction du tempo, avec support du format REXTM. Time Machine II nouvel algorithme de time pitch shifting et time stretching en temps réel. Nouveaux formats audio supportés en import : EX , EXS MK II and Samplecell . Drag and drop a parti du bureau dans Kontakt des fichiers audio et des instruments. J'ai toujours été plus "synthé" que "sampling". Du coup, je viens un peu tardivement aux joies de l'échantillonneur virtuel et sans avoir connu celles des sampleurs virtuels. A réception, j'ai été un peu déçu par le rapport : Place sur le DD/ et nbre de patches de samples offert par Kontakt... (notamment une joie bien moindre qu'à réception de Reaktor qui offre immédiatement un terrain de jeu infini...). Puis progressivement à l'utilisation j'ai mieux apprécié la qualité des sons et les possibilités d'édition de ce logiciel qui sont très riches (modulation, effets et combinaison... ) . Finalement, c'est un excellent outil. Le mode d'emploi est d'une taille raisonnable et la prise en main n'est pas ultra difficile. Et l'ergonomie/convivialité de cette V3 est tout à fait convenable (en regard de ce que disaient les utilisateurs des premières versions réputées un peu plus spartiates). Utilisé sans pb avec GB en AU sur un macbook intel et 4 Go de ram. Je n'ai pas connu Kontakt dès ses débuts. Prise en mains depuis +- 3ans. L'interface a gagné en convivialité. Mon avis rejoint celui de Ptilou, pour l'ensemble. Par contre, il ne faut pas s'attendre à une qualité exceptionnelle pour tous les sons. Et je le trouve un peu maigre dans sa banque de sons "synthé", ceux-ci proposant des réglages minimalistes. Mais bon, pour plus il faut se tourner vers les autres produits de la marque.